From time to time, you will need to update your WordPress installation to the latest version. WordPress has a built-in alert system that lets users know when their installations are out of date. Whenever a new version of WP is released you will see a message at the top of your wp-admin dashboard and in your sidebar indicating that you need to update your installation. It is important to pay attention to these alerts. Sometimes security vulnerabilities are corrected with new WordPress releases. Updating to the newest version of WordPress will ensure that you have the latest security fix. Not updating your version of WordPress may leave your site open to hackers. At other times new features are added, making improvements to the functionality of WordPress. FTP access – I never update a WordPress installation or plugins unless I have FTP access. FTP stands for File Transfer Protocol. Filezilla is a free open-source FTP program that you can download and use for transferring files from your website’s server to your computer. Make sure you can connect. Backup of your site. 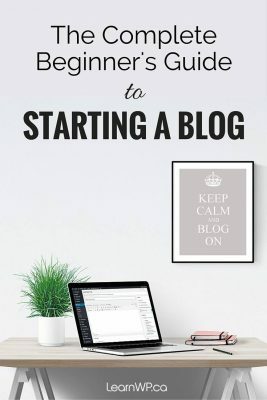 All your posts and pages are held in the database, it’s important to backup your database and your website files on a regular basis and before upgrading your version of WordPress and your plugins. WordPress Managed Hosting is the easiest option but you can also use a Backup Plugin to schedule regular backups. 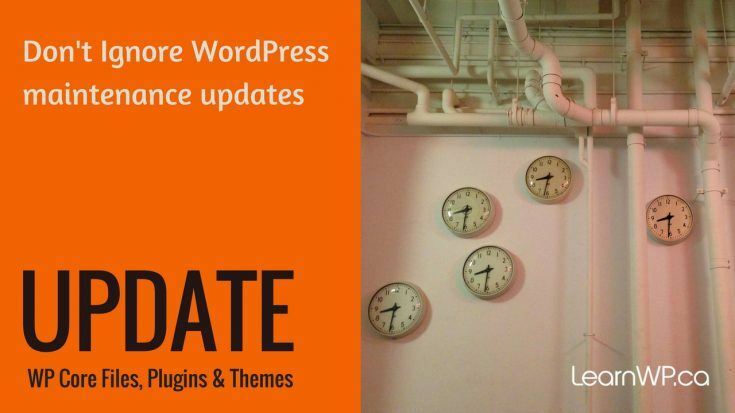 The WordPress team recommends that you disable plugins before updating your site. If you wish to disable the plugins, go to the Manage Plugins page in the Dashboard, changing the “Bulk Actions” pull-down menu to “Deactivate” and clicking “Apply”. If a plugin breaks your site during an upgrade, you’ll need to be able to access the /wp-content/plugins directory on your server via FTP. Simply rename or delete the broken plugin and your site will be restored. Automatic Update. Clicking the automatic update button will work for most people. 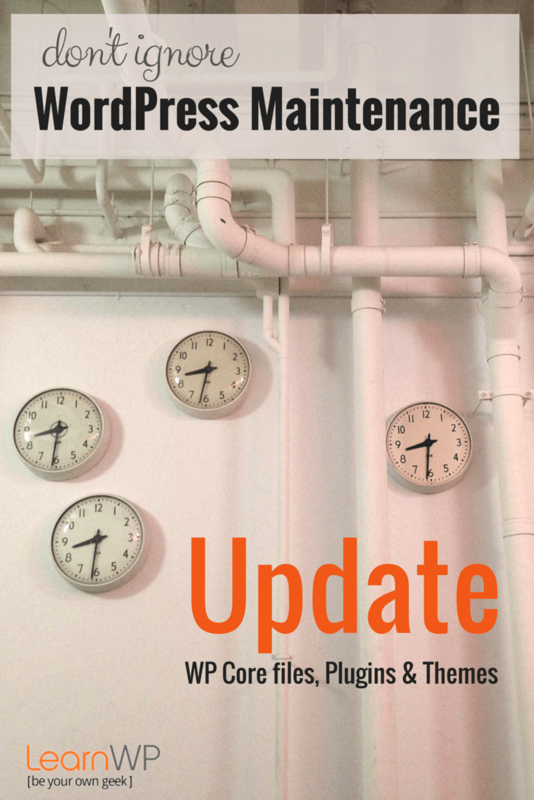 If the automatic upgrade doesn’t work for you, don’t panic, just try a manual WordPress update. Enable your Plugins again! If a plugin itself needs updating you will want to update it before you enable it. Now visit your site and make sure that everything is working properly. Some plugins may become outdated and no longer work with a newer version of WordPress. If you have issues after activating a plugin, deactivate it and visit the plugin’s website. Many plugin authors will upgrade their plugins to accommodate the newer version, but some won’t. Some plugins will become obsolete with the improvements in WordPress. If a newer version of a plugin is available in the WordPress Plugin Repository you will see a number next to the plugin in the left-hand column of your wp-admin. This number indicates how many plugins need your attention. In the Manage Plugin panel, a message will display along with a link to the location to download that new version. It is also advisable to deactivate a plugin before updating it. If an active plugin fails during upgrade your whole site can be adversely affected. Once updated you will be able to reactivate the plugin. If you have made any modifications to a theme, updating the theme will overwrite your changes. It is best to create a child theme to protect modifications so that themes can safely be updated. Read more about updating themes here. With a little effort on a regular basis, you can keep your site current and safe from security threats! If you have any questions about WordPress updates, please add a comment below. Join us to learn WordPress with Gutenberg, May 9 & 10, 2019. Or subscribe here to get our blog posts sent to your inbox. Thanks for the great suggestions. I can’t wait to take your two day WordPress workshop. The 2-day WordPress workshop was the best value anywhere. Despite having zero experience, I learned to create and maintain my own site, without having to depend on an outside administrator. I’ve had rave reviews of my website since I launched it, and everyone says it’s clean, easy to navigate and looks great. Thanks, Ruth and Dawn for helping me launch my business! Great workshop! Loaded with a lot of information. Ruth and Dawn were awesome… they really know their stuff. I recently built my new professional website with Ruth and Dawn (holding my hand the entire way) in one of their two-day workshops. 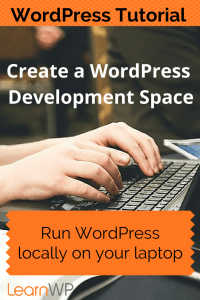 I had already spent many hours with techie friends and family, trying to build a WordPress site. This was an eleventh-hour attempt to do it myself so I could make frequent updates… It was the highlight learning experience of the year. Dawn and Ruth make an excellent team with the vast knowledge and experience between them! 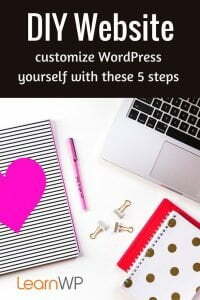 As a newbie WordPress website manager with six months self-taught knowledge, this workshop provided a much deeper knowledge about WordPress, the new Gutenberg editor and helpful external resources and provided this knowledge efficiently. Dawn and Ruth are patient and navigate through the various skill levels of the workshop participants with grace and ease. They are super supportive before, during and post workshop completion. The LearnWP Intensive workshop is well worth the cost and not only met, but exceeded my expectations! Thank you again!